Week night supper. I fixed this on one of those nights that we were all needing to eat at different times. It sure did beat grabbing sandwiches from a fast food place. Put all the ingredients in the crockpot. I always hesitate to say how long to cook something in the crockpot because different pots cook differently. Also, I freely adjust the cooking time based on what time I put the food on to cook and what time we need to eat it. Often I start things on high and then turn them down. Since that wasn’t helpful at all, I’ll say cook this on low for 6-8 hours or high 4-5 hours. But promise you won’t hold me to those cooking times! After cooking, pull the chicken apart with a fork. Serve over rice. I didn’t have time to deal with rice that day, so we just toasted bread and served it over that. Looks very easy and tasty! I’m going to do this! The only thing I need is pimentos so next time I’m at the grocery store I’ll pick them up. I have always wanted to try chicken ala king. I will give it a try. I will need to get pimentos also. I’m really not sure what they are, but I will figure it out. oh yum, thanks! I will definitely try this. This looks so good! 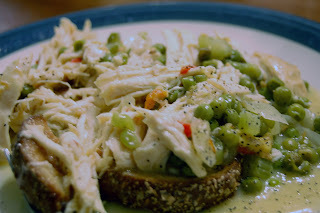 I’m constantly collecting crockpot recipes, and I’ve never tried this one before. In case you haven’t heard, I’m planning on marrying my crockpot. It always has a hot dinner waiting for me. I will have to try this out. Love cooking with a crockpot. I should really do it more often! Is it OK to make this with frozen chicken? Or does it need to be cooked first? You can make this from frozen. I like to use chicken tenders or boneless when I do that. And I like to start it on high too. I invested in a quality rice cooker, which. I put on a timer ( I got mine from Ace Hardware- the kind you use for turning lights on and off for vacation.). Set up your crock pot meal. Switch on the rice cooker on and plug into the timer, set it 1/2 hour before meal time. Then cone home to rice and crockpot meal…my rice cooker has a steam insert, so I put the rice in the bottom and put the steamer with broccoli on top. A meal and sides and no worries…I love your site…freezer prepped meal in a bag is just pure genius! Dottie, I love, love, love this idea! Super smart to use a timer with the rice cooker and I had no idea it would steam veggies too. I need to get one of those! THanks for sharing. Hi! I love how simple this recipe is! 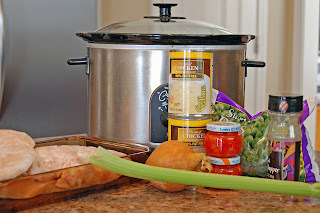 I have one question….. could I use chicken stock or thickened stock w/corn starch instead of the soup? We are a dairy free house…. I think you could thicken the chicken stock with cornstarch and it would work.